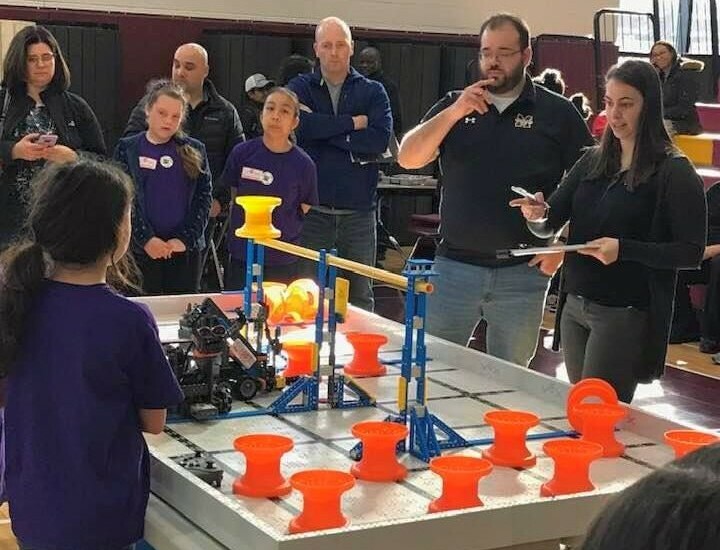 On Saturday, March 16th, Bishop McNamara High School hosted the 1st Annual DMV Catholic Schools Cup Robotic Championship where 24 teams from 6 area Catholic schools from Washington, D.C., Virginia and Maryland competed in the VEX Swept Away competition. Congratulations to the 98 participants from these partner schools and thank you to the many BMHS faculty and staff who served as organizers, referees, judges, announcers, field queriers, and inspectors. Thank you to our employee volunteers - Matthew Buckley, Jan Steeger, Abigail Greer, Michael Murphy, Joanne Walther, Matthew Walther, Nicholas Klimczak, Megan Judd, and Charles Shryock - who made this a terrific event and a real success for students from these partner schools. The ultimate victor was The Fantastic 4 team from St. Peter's School in Waldorf, MD.